As in previous years the British Motor Museum has been very active in attending motoring related shows and events throughout the Midlands. This year’s presence has been even more significant as it has given the Museum the opportunity to really promote its refurbishment over the winter and the opening of the new Collections Centre. The help of volunteers at these events has now become integral to their success and a hard-core of regulars now put their names forward to help. In many cases a ballot has to be held to select the chosen few. Whilst most vehicles on display are tailored to events, some lucky volunteers occasionally get the chance to drive a car to the venue. So, where have we been so far this year and did you see us? A very local event - this is Europe’s pre-season historic motorsport event for racing drivers, preparers, trade and public enthusiasts. 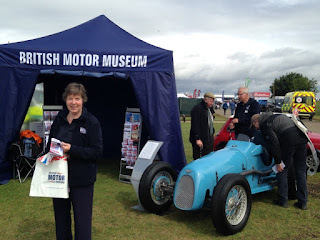 Two volunteers, Robin Lock and John Bartlett, attended this event for the one day where the Museum exhibited some appropriate vehicles in the form of a 1935 Austin Seven side valve racer, the famous 1965 Rover-BRM gas turbine Le Mans car and a 1997 Paris/Dakar Land Rover Discovery. This increasingly popular Bank Holiday event attracts not only classic car enthusiasts, but large numbers of the general public, giving the Museum an excellent opportunity to promote itself. Five volunteers, Chris Bramley, Brian Richardson, Nick Manley, Roger Pantling and Doug Armer, helped to man the stand and spread the word throughout the weekend. On display were the 1935 Austin Seven side valve racer and a big attraction for families was the 2002 Jaguar XK-R James Bond car from the Die Another Day film. Now in its third year, this is rapidly becoming a must see event for the local motorsport and classic car enthusiast, with live action on closed roads. 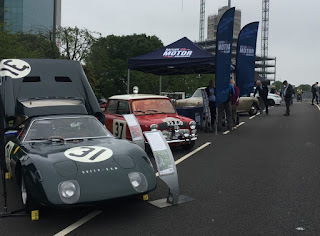 Not only did the Museum take along four cars for display, but two of them, the Paddy Hopkirk 1964 Monte Carlo Rally winning Mini Cooper S and the 1965 gas turbine Rover-BRM, were in action on the Ring Road circuit. Six volunteers, Norman Lee, John Bartlett, John Lambert, Philip Casey, John Sheffield and Nigel Porter, were kept busy over the weekend looking after the stand which also included a 1974 Triumph TR6 and a 1965 Alvis TE21, both very locally built cars. Another huge motorsport event for the classic car enthusiast with both static displays and race track action on all three days. Last year, the Rover-BRM provided some track action, but this year our display was purely static with again the 1935 Austin Seven racer, plus the Rauno Aaltonen 1967 Monte Carlo winning Mini Cooper S. Over the three days, volunteers Chris and Jan Bramley, Norman Lee, Brian Rainbow, Roy Thole, Roger Williamson, David Wise and Peter Burke were on duty. This was a busy weekend for volunteers as apart from those at Silverstone on the same day, four volunteers, Ian Hicks, John Lambert, John Tamkins and Tony Bagley were helping out on home soil. New for this year, this was a fun filled family day of art and science activities all themed around the British motor industry. This included being driven around the Museum’s grounds in a 1952 Riley RMA. Just down the road from the Museum, Compton Verney Art Gallery and Park put on this one day fun event celebrating everything about the 1950s. 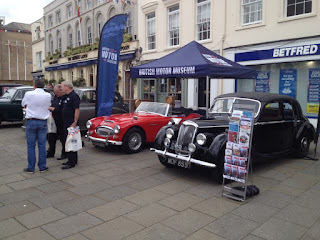 The Museum was invited to join in the fun and volunteers John Lambert and Leslie Gunde drove a 1966 Austin Healey 3000 Mk111 and the 1952 Riley to the event to entertain the public. Held in Warwick’s picturesque market square this popular annual event attracts around 150 pre-1990 classic and retro cars. Again, the Museum brought along the 1952 Riley RMA and the 1966 Austin Healey 3000, driven to and from the event by volunteers, John Sheffield, Chris Fieldhouse and Alec Evans. Our final event of the year will be part of the British Motor Museum’s stand at the annual Lancaster Insurance Classic Motor Show at the NEC from 11 to 13 November. We’ll be on Stand 150 in Hall 2, exhibiting the 1967 Aaltonen Monte Carlo winning Mini, HUE the famous Mk1 Land Rover and a 1899 Wolseley Voiturette. Do come along and say hello.